This is the sermon I preached on 4/8 at St. Timothy Lutheran Church and St. Mark Lutheran Church. The gospel text is John 20:19-31. I learned a lot in seminary. One thing, however, that always sticks with me is about how we are to understand and interpret scripture. We need to remember that God is always the One doing the acting in the Bible. 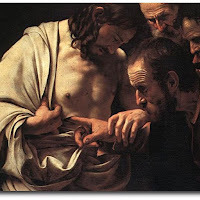 When we hear today’s gospel lesson, don’t we end up concentrating on “doubting Thomas?” I know that’s what happens to me and so we think that’s what the lesson is all about, but it isn’t. We need to return to the maxim that God is always the One who is doing the action. That being the case, we will look at today’s gospel through the lens of what God is doing and what kind of response that should elicit from us. First of all, we need to realize that there are many, many things God is up to, while we’ll only focus on a few. You have to admit that Jesus makes quite an entrance. Here is this group of his followers huddled together in fear behind closed and locked doors. All of a sudden, there’s Jesus! How did he get in? He wasn’t a ghost, but apparently, doors and walls were no obstacle. We must not be too hard on the disciples regarding their fear. They had reason to be afraid. John the Baptist had been killed for his faith, their Master was crucified and they could be next. Given the political and religious climate of the time, I would be afraid too. Historically, all of the disciples did die martyrs’ deaths, except for John. Just a word regarding who the disciples were afraid of. Our translation says the doors were locked “for fear of the Jews” (v. 19). More accurately, they were afraid of the Jewish religious authorities, not the Jews in general. Jesus greets his followers with a very common greeting, “Peace be with you.” It can simply mean “hello,” but particularly, in this case, Jesus is communicating a profound peace and wholeness to the broken, frightened disciples. However, they did not recognize Jesus until they saw his hands and side. They must have thought they were seeing a ghost, but then God provides very real, physical signs by which Jesus’ followers would know he was there physically with them. Now that the disciples knew this really was their Lord standing there with them in the house, Jesus bids them peace a second time. This time Jesus has something for the disciples to do. “As the Father has sent me, so I send you” (v. 21). Jesus not only gives them their commission, but gives the disciples the power to do this work saying, “Receive the Holy Spirit” (v. 22). Jesus’ breathing the Spirit upon the disciples especially makes us think of creation when God breathed into man the breath of life. Breath and spirit are the very same word. God’s holy breath animated the first human and the Holy Spirit empowered the disciples for the work of ministry. This is exciting, heady stuff that’s happening here, but now we find out that for some reason, Thomas was not with this group of disciples when Jesus first came to them. The disciples told him what happened, but he did not believe them. Can you blame Thomas? Earlier in this chapter of John, we have Mary Magdalen’s encounter with Jesus in the garden. She did not recognize Jesus either until he spoke to her. Then when Mary tells the disciples about seeing the Lord, they do not believe her, until they see for themselves. Thomas only wanted the same opportunity to see the Lord as the others had. And so a week later, the disciples still have not moved on Jesus’ mission for them. They were still behind closed doors. This time Thomas was with them. Again, Jesus greets his followers with peace. Now, for Thomas’ benefit, Jesus offers him the chance to put his finger into Jesus’ wounds and to put his hand into Jesus’ side. Did you notice that Thomas’ condition for belief was that he sees the mark of the nails in Jesus’ hands and put his finger in them, as well as putting his hand in Jesus’ side? Jesus’ offer must have shocked Thomas. It was as if Jesus had been with Thomas when he made the statement about his conditions of belief. I think I have heard somewhere that God is all present. There’s another bit of poor translating we need to address here. Our version has Jesus telling Thomas, “Do not doubt but believe” (v. 27). However, the Greek word for “doubt” is not used in this passage at all. There is a special word for doubt and it is in the New Testament, but not here. When Thomas realizes he is really seeing his Lord, he cries out, “My Lord and my God!” (V. 28). Now that’s some dramatic turnaround Thomas has. The question we must come to terms with is how will we respond to Jesus’ proclamation of peace to our troubled hearts? We too have the choice to become believing or unbelieving. The challenge was not merely to Thomas or any of the other disciples of that day, but to us too. Jesus tells Thomas that the blessed are “those who have not seen and yet have come to believe” (v. 29). That includes you and me! What I love about Jesus’ meeting with Thomas is that it makes clear that those of us born so long after Jesus’ earthly life are not left out. Then there’s icing on the cake, “…these are written so that you may come to believe that Jesus is the Messiah, the Son of God, and that through believing you may have life in his name” (v. 31). Wow. God wants us to have full, abundant life, but it’s not just for our own benefit. This good news that gives life needs to be shared with others. We may complain that we aren’t strong like Jesus’ first followers. In today’s gospel reading, they don’t sound very strong to me. It’s because of weakness that God’s Spirit can work through his people. Did anyone notice that even though he was resurrected, Jesus’ body still bore the wounds suffered in crucifixion? We too are broken people who must take care not to go out in mission pretending to be whole, pretending to be all- competent, pretending to have all the answers. Rather, “we offer ourselves in vulnerability and woundedness, standing in solidarity with the world’s woundedness, yet in the power of Christ’s resurrection” (Titus Presler). How do we stand in solidarity with the world’s woundedness? Just as Jesus showed his disciples his wounds in a real, physical way, so too we need to physically reach out to the needy. Show God’s love by shopping for someone who can no longer do so for themselves. Visit the lonely and shut-ins. Listen as someone tells you their story. Heal the sick with your presence, prayers, and love. Bring God’s peace with you everywhere you go. Here’s one way to look at the church’s mission. By loving one another as Jesus loves, the community of faith reveals God to the world. By revealing God to the world, the church makes it possible for the world to choose to enter into a relationship with this God of limitless love. Our mission is to bear unceasing witness of the love of God in Jesus.